Every morning, people all over Atlanta walk outside to find electric scooters littering the urban landscape. Once night falls, the scooters, called Birds for the company that distributes them, vanish just as quickly as they appeared. These Birds are part of a new transportation concept that allows users to ‘check out’ a scooter they find out in the world and pay by the minute until they reach their destination. Once there, they simply abandon the scooter and continue on their way. Certified users are paid to collect the Birds at night to charge them, placing them in popular areas the next morning. This seems like a great idea: fewer cars on the road, more enjoyable commutes and a reasonable solution to the too-far-to-walk-but-too-short-to-drive dilemma. But from what we have seen over the past month, and what we will see for the foreseeable future, is that these Birds may not have been ready to leave the nest. The scooters are meant to be ridden in bicycle lanes, and for good reason. Cyclists and Bird users take up a similar amounts of space and move at comparable speeds. If a route lacks bike lanes, users are left with a Sophie’s Choice of sorts: disrupt pedestrian traffic on sidewalks or try their luck on the open road. Both of these options are far less than ideal. Birds move far too fast to reasonably ride alongside the average pedestrian on a sidewalk, and their silence prevents walkers from hearing a rapidly-approaching scooter. On the road, it is difficult to stay on course without eventually leading a parade of honking cars. Neither method is effective, yet Birds still find their way into streets and sidewalks. The issues are not limited to when the vehicles are in motion, either. Shoving discarded scooters out of the sidewalk has become a hallmark of on-foot commutes. People utilizing wheelchairs often find themselves barred from a sidewalk altogether. In a sense, their omnipresence is a double-edged sword. While this isn’t exactly a pressing matter at the moment, the start of classes in the fall could bring a huge problem with it. What happens when students living in Tech Square, Centennial and Home Park all want an easy ride to their noon class at Clough? 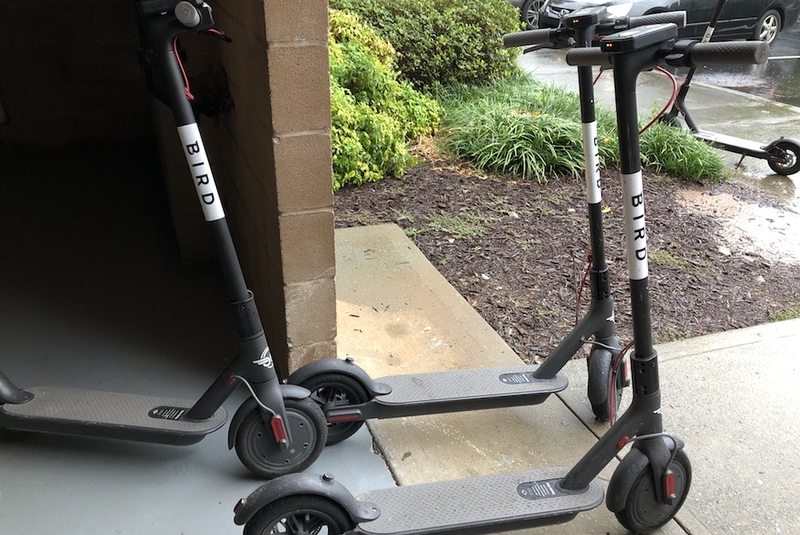 If Bird is expected to maintain its current popularity into the school year, that is an issue that must be addressed before Atlanta’s entire flock ends up on Tech Green. In many ways, Bird could prove to be a positive force to campus and the city as a whole. The company pays Atlanta $1 a day per scooter in order to help with infrastructure and several measures have been put in place to reduce safety issues. Usage data is closely monitored, with Bird claiming to reduce the number of scooters if they dip below a 3:1 ride-to-scooter ratio. These policies make up Bird’s ‘Save Our Sidewalks’ pledge, a policy enacted to mitigate the negative effects of the scooters on cities. Their recognition of these issues is a good step, but more concrete action can be taken to reduce problems. Until Bird can solve the issues of increased traffic — both vehicular and on foot — they will continue to draw the ire of city officials and traditional commuters. And if riders do not stop leaving their scooters in areas that obstruct pedestrian traffic, the negatives may ultimately outweigh the positives. Bird is still a new company; these issues could very easily dictate whether the idea takes flight or ultimately proves to be a bad egg.